Marc-Andre Fleury had another disastrous playoffs. Confidence is at an all time low. People were fearing the goalie situation going into this season. So far those all look to be in the past. The playoffs are the most important part of the NHL's season. Careers are spent in pursuit of the Cup. When your ultimate failure comes in that time of year you gain a reputation and Marc-Andre Fleury has, understandably, gained a reputation of a failure. So much so that he began seeing a sports psychologist in the off season. As Tomas Vokoun left the team with an injury and the goaltending stable was not re-stocked with a veteran the nerves grew. What Fleury would we see? As Ray Shero said, "40 wins is hard to replace." 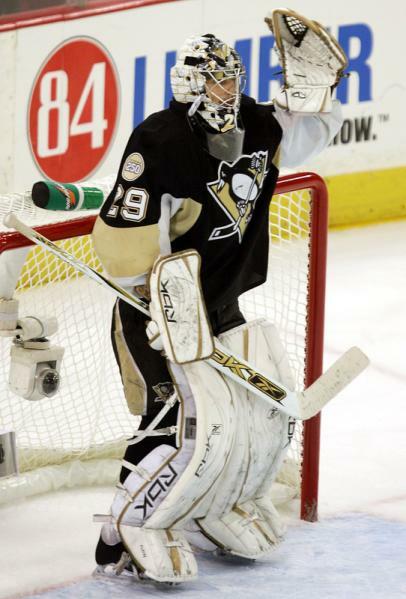 Could Fleury even get the Penguins to 10? Three games into the season and he's well on his way with a shut out, a 1.00 GAA and a .963 save percentage are exceptional. Shouting "SMALL SAMPLE SIZE!" is not undue but recognize a change. A more defensive scheme, a different pre-game routine, a new goaltender? Fleury has drastically changed the way he approached every game. Fewer distractions in not talking to the media. Playing behind a system which is much less run and gun and more insulation. The return of his favorite player in Rob Scuderi. All have had an early effect on Fleury. He looks calmer, more collected and seems to be keeping things simple. He looks... new. Marc-Andre Fleury's bugaboo still lives on. The shadow lies behind him. Winning a Vezina will not be enough to shake the image that has grown of the affable French Canadian netminder. Until he backstops a team beyond the second round or thrives in the heaviest of moments people will doubt him. And they should. No one is saying Fleury is absolved all of his sins. No one is implying that all is fine. "But the playoffs..." is heavily implied in every conversation when discussing the regular season performance of Fleury.. In the now, however, Marc-Andre Fleury is playing very well. Let's give him the credit he deserves.